A Boston Food Diary: Cabot Cheese, A Give Away, Mussels and Biscuits! I love cheese-its just a fantastic product isn't it? It is just so versatile as it comes in all different flavors and tastes, textures and application possibilities- a warm pot of melted cheese and wine for Fondue, a comforting grilled cheese sandwich on a cold day, gorgeous fresh mozzarella standing up to fresh tomatoes, sweet basil and garlic in salads. Finally, there are those wonderful cheese plates to end a meal with- beautiful cheeses to satisfy the sweet and savory tooth. Who can resist lovely cheese? One of my favorite types of cheese is cheddar and one of the best suppliers of cheddar cheese is none other than Cabot, which was begun in Vermont in 1919. One of the very cool things about Cabot is that they are actually a Coop- meaning that their cheese comes from dairy farmers all across New England-so buying Cabot here in Boston means buying local. Even more exciting though is that Cabot is not just local- they are sustainable as well. Cabot upholds the principles of sustainability farm to farm- and cow to cow. They know that their cheese is a direct product of the land they live on, and they want to take care of it. I tip my hat to them for their efforts! 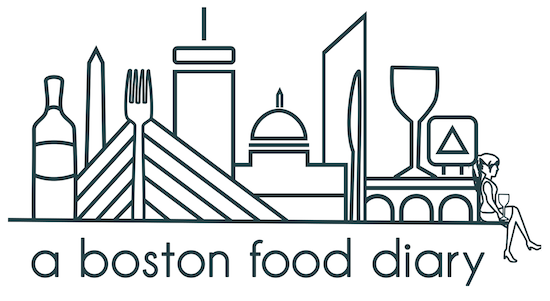 Here's the fun part- THE FIRST EVER A BOSTON FOOD DIARY GIVEAWAY! Send me a note with a suggestion for your favorite way to use Cabot Cheese-whatever you like, where ever your imagination takes you- we'll select the best one- and the winner receives a lovely Cabot Cheese Gift Basket! This is sure to be a crowd pleaser so get in your entries by noon on February 11, 2010, and we'll choose a winner! Entries can be sent to abostonfooddiary@gmail.com. To get you started on some ideas- the lovely folks over at Stephanie's on Newbury sent me some recipes earlier this week to try out-featuring Cabot Cheese. 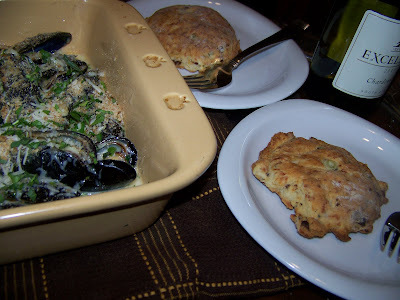 Though they all looked amazing- I only had time to try out two last night- the Mussels Au Gratin and Cabot Chipotle Cheddar Cheese and Bacon Biscuits -yummy! Preheat oven to °400. Line a cookie sheet with parchment paper. baking powder and salt (sifting together is preferable). With a pastry blender cut in cold butter until the mixture looks like crumbs. 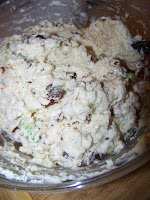 Add cheese, bacon and scallions and mix lightly. Add the milk and stir with a wooden spoon or rubber spatula being careful not to over mix. 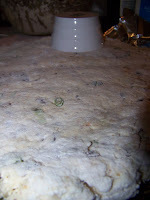 On a lightly floured surface, hand pat down the dough until about a ½ inch thickness. Cut into 4 inch circles and place evenly on the cookie sheet. Bake biscuits until golden brown, about 30 minutes. 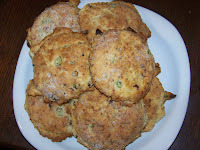 Now I am not a baker- by any means- but this recipe was easy and the biscuits were delicious. A few notes- I sadly couldn't find the Chipotle cheese in my grocery store- so I subbed in Chili Lime. I actually wish that I had added a bit more cheese as I wasn't able to taste the flavors of it as much as I had wanted but the Bacon and the Scallions added in these great flavors of smokey and onion- and even better those ingredients did a great job of breaking up the texture. I would love to have made the Beef Stew recipe that was sent a long- I bet these guys would have been awesome with that! Pre-heat the oven to °475. In a medium sized sauté pan over high heat melt the butter and heat the oil. Do not brown. Add the mussels, garlic and shallots and sauté until the mussels start to open. Add a ½ T of each herb and sauté for an additional 1-2 minutes. 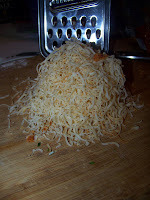 Add white wine, heavy cream and 2 T Parmesan cheese and reduce by half. 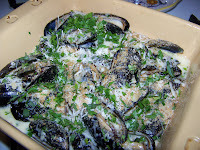 Place mussels in an oven proof serving dish and top with bread crumbs and cheddar cheese and bake until brown. 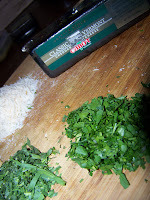 Remove from oven and sprinkle remaining Parmesan and herbs. Enjoy. Now I love Mussels- but I've never baked them before so I was excited to try this new way of cooking them! I have to say-I think I failed here. 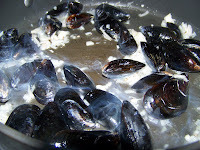 Mussels-I know-cook very very fast. They are one of those easy great things that you can cook just before people arrive because the are a breeze. I think that I moved a bit too slow last night. Where the instructions say to saute the mussels until they start to open-I believe that I left them a bit long at this stage before adding the herbs, and then perhaps the time between the herbs and adding the cream and wine should have been a bit shorter. By the time I transferred the little devils into my oven safe dish-they were all pretty much done. The browning time in the oven just sorta added insult to their injury. Now don't get me wrong- that broth is killer-creamy but perfectly seasoned from the garlic and the shallots. 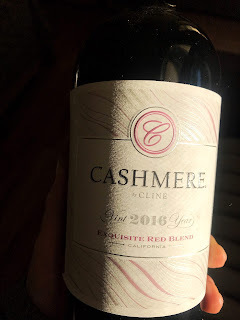 Little hints of parsley and tarragon are like notes of flavor throughout. The cheesy crust created during the baking was awesome-totally decadent. It added nice texture to the dish which was other wise lacking. 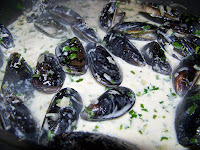 The mussels-the ones I hadn't overcooked- had adopted all of those wonderful flavors and were delicious. We did use those biscuits to sop up the broth as well- that was a lovely combination!! So there you have it- those are the suggestions from Stephanie's on Newbury for two types of Cabot Cheese- what are yours??? My first thought when it comes to cheese is mac and cheese. A mixture of Cabot cheeses would make an awesome one! I also love just packing the little individually wrapped pieces of Cabot cheese for a snack. Mac & Cheese is definitely a good idea! Cabot has such a large array of different flavors of cheddar each batch could be 100% different! Thanks!